Last chance to reapply cancelled subjects. Last date is 16.10.2018 to change your subject. To check notification see it. Now UP TGT PGT 2016 VACANCY LATEST NEWS is UPSESSB open the official link on pariksha.up.nic to their respective subject. Candidates their subject cancelled can change new subject. It is very easy to change new subject for rained tgt pos and pgt post. 2. Enter Registration number and D.O.B. 3. Verify with Registration number or OTP. 5. Select your new subject according to qualification. 6. Fill your education qualification detail. Remeber first two pink option are mandatory to fill. 8. Print your new form subject receipt . there is problem for Tgt biology vacancy candidates. Now Tgt science need Physics and chemistry subject in Graduation. TGT math need math subject in Graduation. So TGT BIOLOGY candidates can apply TGT Science vacancy on their risk. UPSESSB ( Uttar Pradesh Secondary Education service selection Board ) has eliminate /cancelled 341 post from 2016 tgt pgt recruitment through 2000 act. Recently a notification publish to cancel subject: Biology, zoology, Art ,Wooden Craft , Music, Tankar, Stenographer Vacancy from 2016 recruitment. Reason given as non availability of subjects in UP 10th and 12th Syllabus. UP TGT PGT 2016 VACANCY LATEST NEWS is now , Exam will not be conducted in September. New date of Examination publish soon. YOU can check cancel vacancies Notification here. 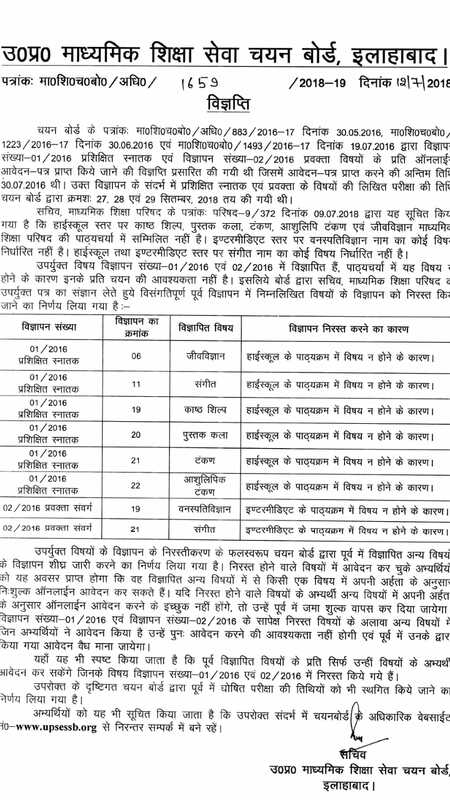 Uttar Pradesh Secondary Education service selection Board issue a notification on 12.07.2018 regarding cancellation some vacancy from 2016 recruitment. UPSESSB eliminate some tgt pgt subject from 01/2016 & 02/2016 recruitment. These subject are given below. UP TGT PGT 2016 VACANCY LATEST NEWS : CHANCE TO APPLY FOR CANCEL APPLICATION. According to UP TGT PGT 2016 VACANCY LATEST NEWS . Total 69830 application form cancel for 341 post. All cancel application form candidates can apply for other vacancy acording to their eligibility. If any one don’t want to apply again, his/her fee reimburse in his account. Date to apply again publish on upsessb.org official site. Subjec wise detail vacancy acording to 01/2016 recruitment for tgt post. up pgt vacancy detail according to 02/2016 recruitment 2016. You can go on prakisha.up.nic official site and chance you option.